Alarm clock. Receives AM/FM (digital radio). AUX-input to play music from external MP3 player. DC power option (mini-USB cord included). Eton FR-300 ETON AM/FM/TV-2 WX EMERGENCY RADIO - HAND CRANK W/ FLASHLIGHT. Up for sale is the Eton FR-300 Radio Weather receiver you see pictured.You can use 3 AA batteries to run it,or an AC adapter(not included). 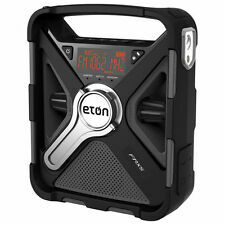 5 out of 5 stars - Eton FR-300 ETON AM/FM/TV-2 WX EMERGENCY RADIO - HAND CRANK W/ FLASHLIGHT. 2 product ratings2 product ratings - Eton FR-300 ETON AM/FM/TV-2 WX EMERGENCY RADIO - HAND CRANK W/ FLASHLIGHT. Trending at $11.76eBay determines this price through a machine learned model of the product's sale prices within the last 90 days. New in open box. AC adapter is not included. This very compact portable receives AM, FM and seven NOAA weather channels. Plus there is a built in three LED flashlight! There is also a mono 3.5mm earphone jack (earphones not supplied). MICROLINK FR160. Like new. Never actually used. Fast shipping! 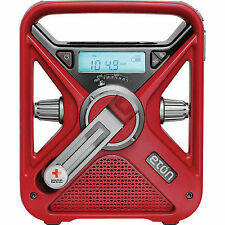 Eton American Red Cross Axis Self-Powered Safety Hub with Weather Radio and USB Cell Phone Charger (ARCPT300W). - Digital tuner with AM (520-1710 KHz) & FM (87-108MHz), NOAA weatherband - all 7 channels plus Alert. 5 out of 5 stars - Eton Axis Self-Powered Emergency Weather Radio and USB. Hand Crank. 2 product ratings2 product ratings - Eton Axis Self-Powered Emergency Weather Radio and USB. Hand Crank. Item is brand new and was never used. Box damaged, please see pictures. Trending at $35.88eBay determines this price through a machine learned model of the product's sale prices within the last 90 days. No AC adapter but works fine with disposable batteries or hand crank. Only two of the three LED diodes work but it's still plenty bright. See last photo. 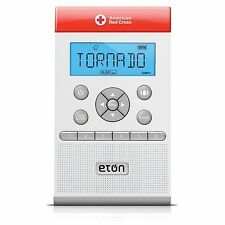 American Red Cross ETON FR400 Emergency Radio, White AM/FM/TV1/TV2/Weather-New. Condition is New. Shipped with USPS Priority Mail. *New* ETON FR400 Emergency Radio, pink color, AM/FM/TV1/TV2/Weather. Condition is New. Shipped with USPS Priority Mail. Item is new, never used. See picture of actual item for sale. The FRX3 is a multi powered, multi function, smart phone charging, digital AM/FM and weather alert radio that lights your way. Color is Red. Good Luck! FRX3 radio. NOAA Weather Alert. Hand Crank Power. 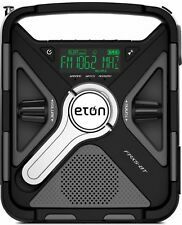 Eton Field AM / FM / Shortwave Radio with RDS and Bluetooth, NGWFBTB. Condition is New. Shipped with USPS Priority Mail. Keep your household prepared with the FRX3. Set the solar panel in the sun or spin the hand turbine for one minute to get 10-15 minutes of radio and flashlight use. There are also AAA battery and DC power alternatives (mini-USB included). Ready to Stream: Listen to your favorite podcast or music from any smartphone, tablet, or Bluetooth device wherever you are. Integrated Bluetooth makes streaming easy with the FRX5 BT. Always on Alert! Keep your family safe and sound with the latest updates and news with the FRX3 digital radio. You have direct access to weather updates with the NOAA bands and alert feature. The bright LED flashlight is always handy. Crank the hand turbine for 60 seconds and get 15-20 minutes of music, news, and 24/7 weather updates and you can plug in headphones for individual listening. LED Lights FRX1 Eton's FRX1 Series has comfortable, durable hand turbine handles that tuck neatly into the unit when not in use. This Eton FRX1 packs a ton of features into a super compact size. This unit is mighty enough to play tunes and news, receive weather alerts, and light the night. 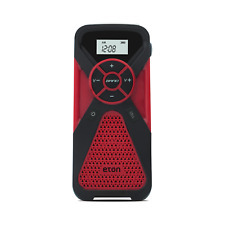 It is a multi-powered, multi-function analog AM/FM and Weather Alert Radio, that lights your way, and is small enough to store in an emergency kit,backpack, or glove box. It is perfect for everyday use, in case of emergency, or during a power outage. 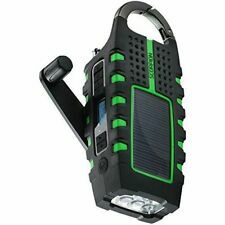 The features include 1) AM, FM, Weather Band analog radio with display 2) NOAA Weather Band 3) Glow in the Dark locator 4) Dynamo motor Hand Crank Power 5) LED Flashlight 6) DC input (mini usb) 7) Headphone Jack 8) Internal rechargeable Ni-MH battery. Dimensions are 5.4" X 2.6" X 2.4". Package includes Radio, owners manual, and mini USB cable. Stay in tune and up to date with this AM/FM/NOAA weather band digital radio with display and alarm clock. Plug in your favorite headphones for solo listening. • Receives AM/FM and NOAA Weather Radio. Digital tuner and display. Bluetooth® ready. AM/FM/NOAA weather bands. S.A.M.E. and NOAA weather alerts. Rugged1 and IPX4 splashproof. High efficiency solar panel charging • Hand crank power. Sorry I don't have the ac adapter. I have 20 of this guys ready to go they all have been manufacturer refurbished. buy the second one for half price. The Axis is equipped with an AM/FM/NOAA weather radio. You can tune into a variety of AM/FM stations and also 7 preset NOAA weather channels. To access these stations select the AM, FM or WB (weather band) channel 1-7 with the band selector switch. Used Eton Multi Purpose Radio FR 300 FM/AM, TV/VHF. With the NO AA Weather Channels, find forecasts when you're away from the set. Its superior audio quality provides clear, crisp sound that allows you to hear every word of a NOAA Weather Band, unlike other models that produce distorted, static-filled audio. Unlike other radios with analog tuners, it has an easy-to-adjust digital tuner that receives radio stations.